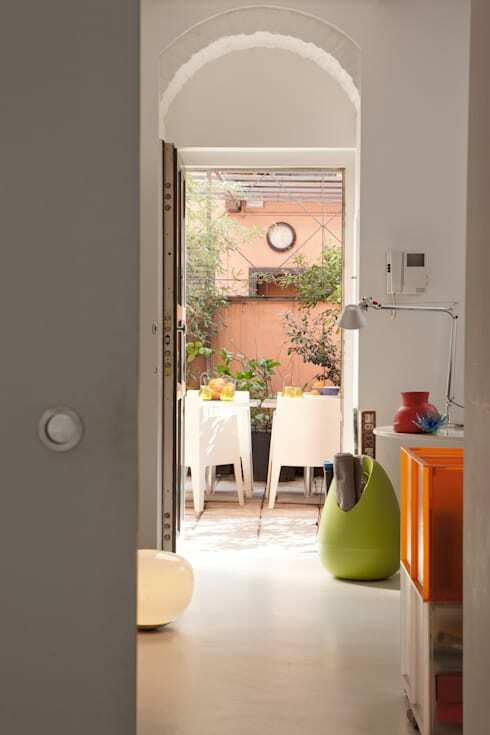 Have you ever been stuck for design ideas to infuse a small house with colourful charm and a spacious atmosphere? Well this home will certainly give you some food for thought. Designed by Milan's Davide Petronici Architettura, this 75m2 abode delights with an inviting energy, with the architects managing to construct an expansive and relaxing dwelling, characterised by modern furnishings and finishes and plenty of colour. The secret of their success lies in the white decor predominating throughout the property, with white walls, ceilings and flooring combined with a series of large windows allowing light to bounce about each room, creating a sense of expanse within the home's humble plan. While pristine white has its advantages however, bare, monotone decor has the potential to appear stark and uninteresting, which is why the designers have brilliantly incorporated a range of bright colours within the home's decoration. A veritable spectrum of tones can be seen in the couches, beds and rugs, enlivening each room with a playful sense of character. The dwelling presents a lovely space in which a small family could create a cosy home, with room to relax, entertain and play amidst colourful, modern surrounds. Take a tour below and tell us what you think! The living area of the home beautifully demonstrates the synergy of white decor encasing colourful decoration, with the space at once appearing inviting and lively. Chic, modern couches wait to accommodate tired bodies, and the spines of myriad books spring from bountiful shelving. Strong, wooden beams stream overhead, providing a bold contrast against the prevailing white of the remaining decor, while a multimedia system including television and record player sits serenely, waiting to infuse the space with visual and aural ambience. Upon entry this home presents an inviting, modern design, with its understated, white walls and ceilings lifted by the inclusion of an array of colourful objects. The decor throughout continues this theme, with white backdrops enlivened by bursts of vibrancy, from the furnishings to the flowers. From this vantage we gain a sense of the open flow of the home, with the prevailing white finishes creating a sense of spaciousness despite the 75m2 plan of the property. 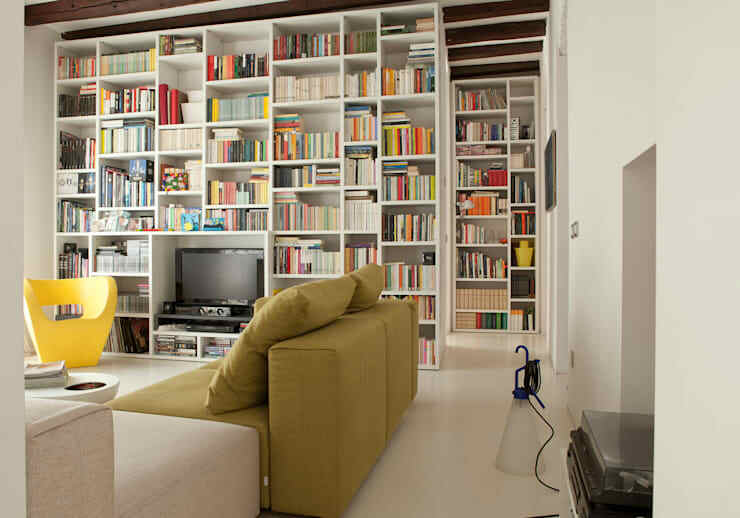 Viewed from an alternate vantage, the living room appears cool and relaxing, with the muted tones of the sofas offsetting the lively colours filling the bookshelves. The curves of a contemporary coffee table add another contrast to the room's design, this time against the clean lines of the sofas and book shelves, while a series of paintings adorn the wall, adding to the depth of character within the space. The kitchen is light, white and modern, with the pristine finishes of white benches and cabinets and stainless steel appliances beautifully illuminated by natural light streaming through expansive windows. 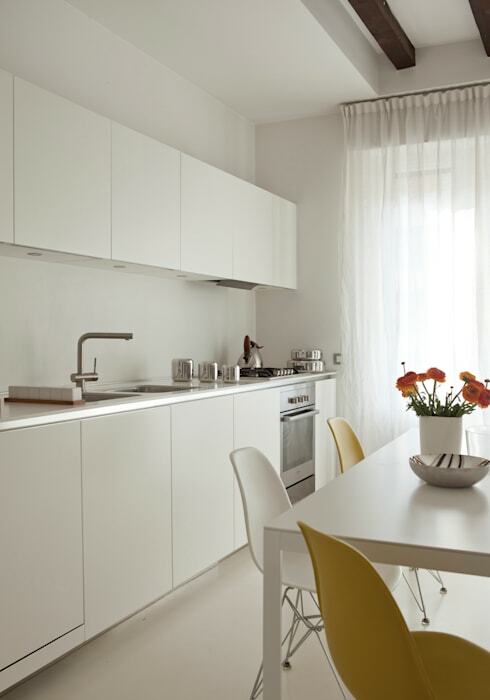 A simple, white dining table sits central within the space, surrounded by contemporary chairs alternating in colour between white and yellow to add a slight contrast within this lightly coloured room. The master bedroom rests in the utmost serenity, with soft light flowing through generous windows, reflecting off the room's pale walls, floor and ceiling. 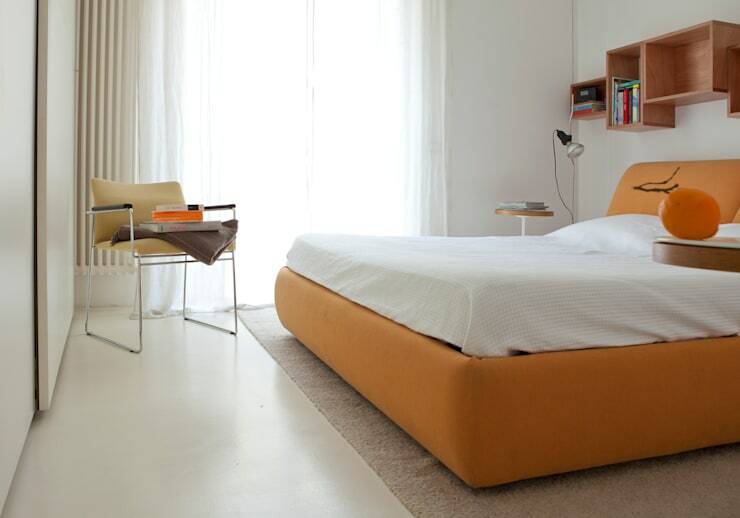 The vibrant, warm tone of a tangerine bed glows from the centre of the room, while an array of geometric, wooden shelves have been included behind, providing a functional, stylish space for storage. Moving through to the bathroom and we find a cosy and inviting space, in which the alabaster tones of the sink and bath warm the room's pristine, white walls and ceiling. 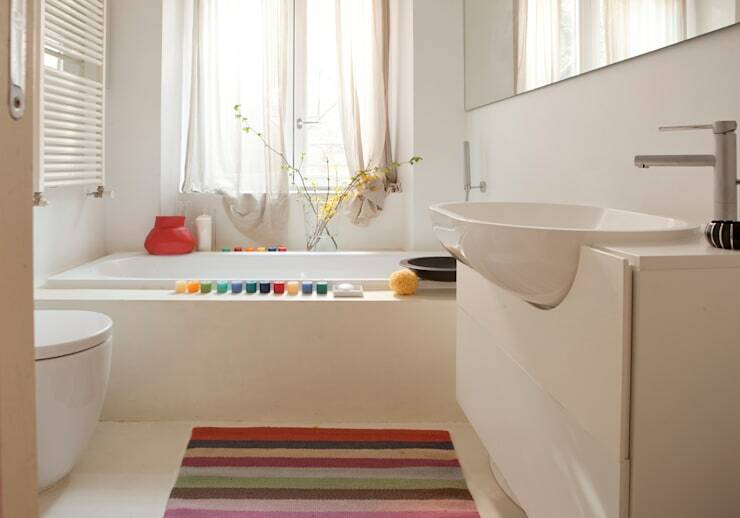 This space also benefits from a steady influx of natural light, which bounces about the pale finishes and large mirror, highlighting colourful elements such as the bright bath mat and rainbow tea-light candles. 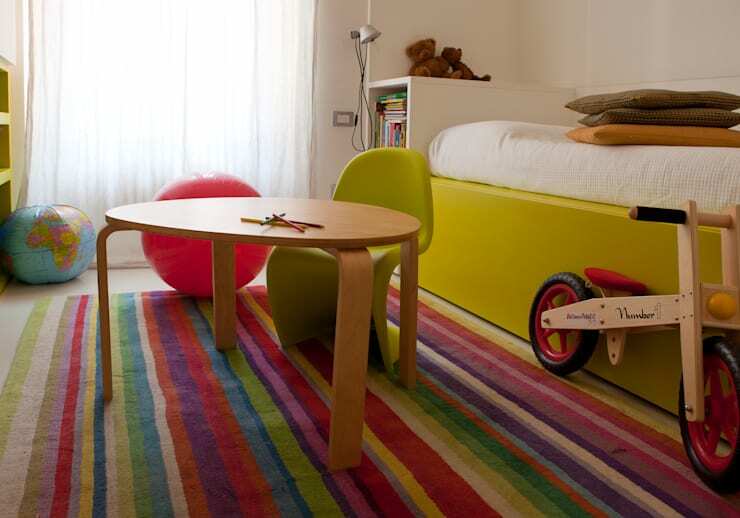 Also included within this cosy home is a brightly coloured children's bedroom, with its playful atmosphere presenting the perfect surrounds for activity and inspiration. The flowing, striped rug enlivens the space with colourful eclecticism, while the contemporary shape of the small desk and chair add a stylish edge. Plenty of storage has been included, with shelves in white and moss green brimming with books and toys, while a vibrant, green bed awaits tired minds in need of restive sleep. For more ideas and inspiration about colourful and vibrant interior decoration have a look at This Bright and Eclectic Loft! 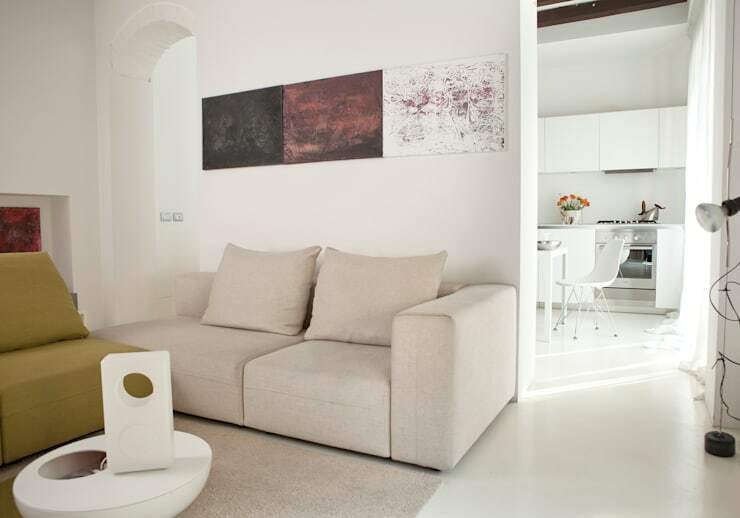 Do you like the combination of white decor and colourful decoration in this cosy home? Tell us your thoughts below!